The four-day, 300-mile event will see the team set off from GEFCO UK’s headquarters at Prologis Park, Coventry on 7th September, travelling across the Channel and through rural France before reaching Paris for a final journey to the Eiffel Tower. 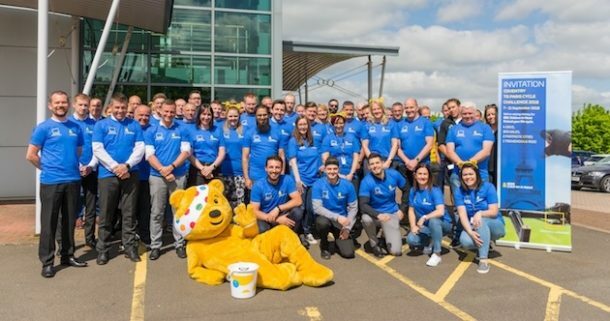 The GEFCO UK team, including over 50 employees who have signed up for the challenge, were joined by Pudsey and BBC Children in Need representatives at its Coventry headquarters as riders were briefed on the challenge ahead, as well as the work BBC Children in Need does to support disadvantaged children and young people across the UK. “We’re hugely grateful for the support that the BBC Children in Need team has offered us so far and it was great to be joined by Pudsey and the team at today’s event to remind us of their brilliant cause and the importance of our donations”. Lauren Baxter, Commercial Partnerships at BBC Children in Need commented: “BBC Children in Need are incredibly grateful to GEFCO for their support, which really will go on to make a positive impact on young lives across the UK.